Literally–we're all baking up here in New England. 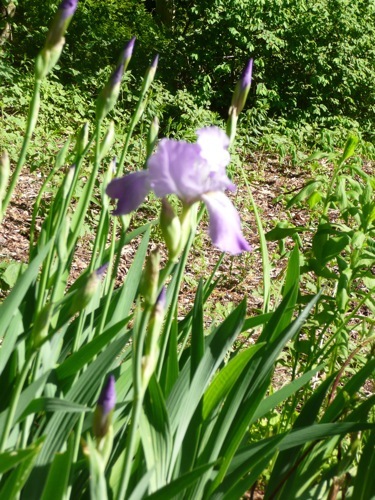 It feels like the hottest part of summer, but the irises are blooming and we're confused. Usually you can easily gauge Vermont weather by what's growing or not at the time of year. There aren’t generally surprises, like this week we’re having with temperatures in the 90’s. And somehow I waited until the hottest day to turn the oven on. That was unfortunate. Before we moved up here, high on a hill in tiny Pownal, I never knew that rocks sweat. It was an illusion the first time, a gleaming wet rock like a sea turtle’s shell. I’m sure that there’s a simple explanation for the phenomenon similar to condensation forming on a glass, but there’s still something perplexing and intriguing about perspiring rocks. It makes them seem akin to the living flora and fauna around them, breathing and alive.